Utah voters have a crowded ballot this year. Here’s what all the questions, propositions and amendments are about. (Francisco Kjolseth | The Salt Lake Tribune) People arrive to vote at the Salt Lake County complex for primary election day on Tuesday, June 26, 2018. Editor’s note: This article has been updated to reflect the latest polling and debate around questions on Utah’s ballot. Utahns will have a hand in deciding the partisan control of the U.S. House this November and will decide whether a former GOP presidential nominee should represent the Beehive State in the U.S. Senate. But the most competitive and debated races in this year’s election don’t formally involve political parties or candidates. Voters will accept or reject several initiatives touching on hot issues such as marijuana, Medicaid and political redistricting, while also voicing their support or opposition for a tax increase to fund schools and a shift in the power balance of state government. With roughly two months to go before Election Day, here’s a look at the questions on the ballot and what they mean for Utahns if they pass. 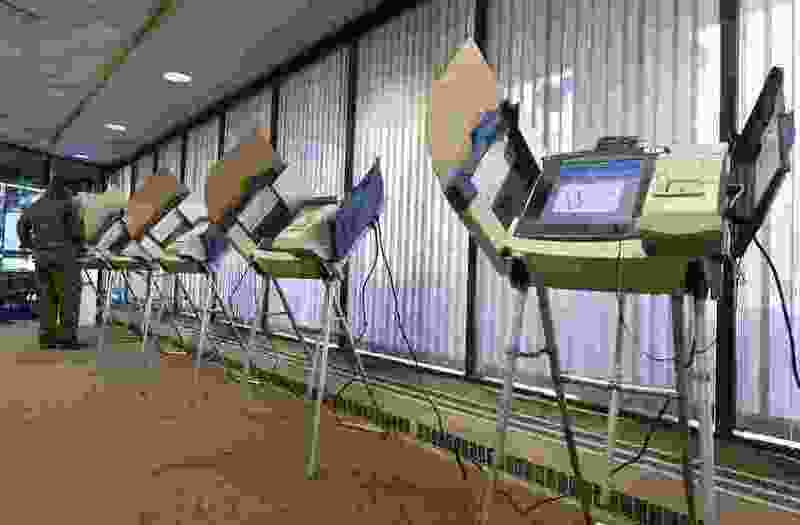 Additional information, including the full text of initiatives and arguments for and against each ballot item, can be found at elections.utah.gov. Formally titled “Nonbinding Opinion Question No. 1,” this Legislature-approved ballot item is the result of a compromise with Our Schools Now. In March, Our Schools Now agreed to set aside its ballot initiative — which sought to raise more than $700 million in annual education funding through income and sales taxes — in exchange for a $350 million combination of property, income and gas tax adjustments. Most of that compromise has already been implemented. But the remaining piece — a 10-cent-per-gallon hike in state gas taxes — will be considered by lawmakers after voters weigh in on the proposal this fall. If enacted, the roughly $180 million in new gas tax revenue would replace general fund dollars currently used for transportation needs, making a corresponding amount available for spending on public education. “Question 1 provides transparency and accountability for critical resources to help teachers be successful and to improve outcomes for Utah kids,” said Our Schools Now campaign manager Austin Cox. But Heather Williamson, Utah director of Americans for Prosperity, or AFP, said Utah’s gas taxes are already higher than the national average. The state has a spending problem, she said, not a revenue problem. The most recent poll by The Salt Lake Tribune and Hinckley Institute of Politics, conducted in early October, showed a narrow majority (51 percent) of registered voters opposing the gas-tax increase, compared to 45 percent of participants who support the proposal. After years of incremental steps by the Legislature on medical marijuana — including legalizing cannabis for patients with six months or less to live — the Utah Patients Coalition successfully placed the issue on the November ballot. If approved by voters, the Utah Medical Cannabis Act would allow patients, on the recommendation of a physician, to obtain a medical marijuana card and buy cannabis products from state-sanctioned but privately run dispensaries. Michael Melendez, policy director for the libertarian-leaning Libertas Institute, said doctors and their patients should be free to pursue legitimate treatment options without fear of committing a criminal act. Critics of Proposition 2, including Utah’s predominant faith, The Church of Jesus Christ of Latter-day Saints, say that while there are legitimate medical uses for marijuana, the initiative lacks the proper safeguards and controls to protect patients and the state’s youths. Michelle McOmber, CEO of the Utah Medical Association, said the initiative’s 28-page bill is full of troubling aspects related to the regulation of marijuana sales and use by qualifying patients. In October, supporters and opponents of Proposition 2 joined with legislative leaders and Utah Gov. Gary Herbert to announce a negotiated “shared vision” for medical cannabis that will be debated and potentially enacted after the election. The replacement proposal is considerably more restrictive than Proposition 2 on the types of patients and products allowed under a state-sanctioned program, and would limit distribution to county health departments and up to five specialized pharmacies. Herbert said he plans to call the session independent of the outcome of November’s election, but some patients' advocates question whether lawmakers and church leaders will follow through on pushing the deal if Prop 2 is rejected by voters. "The good news here is that whether [Prop 2] passes or fails, we’re going to arrive at the same point,” Herbert said. In October, after the announcement of a replacement bill, polling by The Tribune and Hinckley Institute showed that support for Prop 2 had plummeted to 51 percent of registered voters, down from 66 percent in a similar poll in June. Utah is waiting for approval or denial of a Medicaid waiver submitted by the state to the federal government. The waiver would allow Utah to move forward on a bill that partially expands Medicaid coverage to low-income Utahns, while imposing work requirements on recipients and relying on increased federal funding. But Proposition 3, if approved by voters, would bypass the waiver process by fully expanding Medicaid under the terms of the Affordable Care Act, or Obamacare. The initiative would combine $90 million in state funding — through a 0.15 percent sales tax increase — with roughly $800 million in federal Medicaid funding to provide health-care coverage to 150,000 low-income Utahns. William Cosgrove, a pediatrician who supports the initiative, said it is a detriment to Utah’s economic engine to have so many residents unable to access health care. Williamson, of AFP-Utah, said that fully expanding Medicaid under the rules of Obamacare puts the state at risk of runaway health care costs if Medicaid enrollment exceeds estimates. Between June and October, support for Proposition 3 grew from 54 percent to 59 percent, according to a pair Tribune-Hinckley Institute polls. After the 2020 census, Utah lawmakers will redraw electoral districts, which will form the backbone of the democratic process in the state for the ensuing decade. And if Proposition 4 is approved by voters, the Legislature will have help in the map-drawing process in the form of an independent, unelected redistricting commission. The panel would recommend electoral maps — based on guidelines that pay deference to municipal and county boundaries, neighborhoods and geographic features — which would then be approved or discarded by the Legislature without amendment. Catherine Kanter, campaign manager for Better Boundaries, said the initiative is meant to fix a broken redistricting process in the state. There’s an inherent conflict of interest when legislators draw their own electoral boundaries, she said, as they have power to choose their voters instead of voters choosing their representatives. Sen. Ralph Okerlund, R-Monroe, wrote an argument opposing Proposition 4 for the state’s formal election materials. He said the initiative is unconstitutional, interfering in the Legislature’s redistricting process, and that it is politically motivated to boost the success rate of Democratic candidates. Two of the initiative’s four co-chairs are registered Republicans, including Jeff Wright, who worked as finance director for the 2012 presidential campaign of former Utah Gov. Jon Huntsman. Wright said Better Boundaries’ goals of transparency and government accountability represent Republican values and that Proposition 4 is meant to improve the electoral process for all Utah voters. Utah voters backed the creation of an independent redistricting commission by a better than 2-to-1 margin, 61 percent to 22 percent, in an October poll by The Tribune and the Hinckley Institute of Politics. The numbers had improved for Prop 4 compared to a June poll, and now include a plurality of support among Republican voters in addition to a majority of Democrats and independents. Two proposed amendments to the Utah Constitution deal with property tax exemptions. The first, Amendment A, would clarify an existing exemption available to active-duty members of the military. The second, Amendment B, would eliminate taxes on property that is leased by a government entity. Supporters of Amendment B argue that current law is inefficient, requiring the government to pay itself property taxes through leases. Opponents counter that property owners who lease to the government already have the benefit of a reliable tenant and do not need the additional benefit of a tax break. Amendment C would alter the checks and balances of Utah’s state government. Currently, only the governor has the power to call the Legislature into session outside its regular 45-day work period between January and March. The governor also sets the agenda for special sessions, limiting debate to a predetermined number of topics. This amendment would allow lawmakers to call themselves into special session to address a “fiscal crisis, war, natural disaster, or emergency in the affairs of state.” Doing so would require a two-thirds majority vote of both the House and Senate, which under the current Republican supermajorities in the Legislature means a special session could be called without a single Democratic vote. House Majority Leader Brad Wilson, R-Kaysville, said Utah’s annual 45-day legislative session is one of the shortest in the country. That allows elected leaders to represent their neighbors and bring topical expertise from their “day jobs,” he said, but can lead to times when immediate and prompt action is required outside the standard legislative calendar. The governor would maintain the power to veto any legislation passed during such a session but would no longer set the agenda for bills and topics to be debated. Paul Edwards, spokesman for Gov. Gary Herbert, said the governor opposes the amendment. The limits on Utah’s lawmakers have delivered strong results for the state, Edwards said, while the amendment could open the door to frequent special sessions and push Utah closer to having a full-time Legislature.